US Senators Baucus and Tester are holding a meeting to discuss British Columbia’s plans to tear the hell out of upper Flathead river which drains directly into Montana. When you have a President like George W. Bush, you don’t have much moral status to complain about another country wrecking its environment, but the negative impacts of this will be almost entirely felt in Montana, Idaho, and Washington State as the poisons pollute the pristine Flathead River and ruin Glacier National Park. It’s an international incident, and British Columbia’s government needs to get the message. Not many Americans have seen this country. A road leads south from Elko, B.C. past huge ugly coal pits and then into the relatively undisturbed (except for some logging) headwaters of the North Fork of the Flathead River. The road then crosses into Montana. I drove the road about 15 years ago. I planned to go back last summer to photograph what they are up to, but I found this border crossing had been permanently closed a long time ago, not long after I crossed through (maybe just a year or two). So now there is no direct route into the currently wildlife rich and scenic country in BC,* and even on Google Earth the resolution of the area is very low. Update I notice that in the last month Google Earth has finally put in higher resolution photos. They are trying to sneak this through. *I do notice that recent Google Maps shows a growing web of minor road, cuts, and exploration pits. The wildest low elevation valley in the U.S. outside of Alaska. Incredible predator density – wolves, cougar, lynx, marten, fisher, wolverine, grizzly, golden eagles, bald eagles, goshawk all mixed in. What a beautiful place. It’s a shame that there’s not some better system of conservation for it. Great work investigating and raising awareness about this issue. Well it’s really an international matter, and if these permits could be held off, a better Adminisration in Washington might do something. Folks should notice the role of BP here. No, BP does not mean “beyond petroleum” as they pretend in their advertising. B.P. is British Petroleum. There are an oil company, doing what oil companies do — make money and pass on many of the negative effects of their operation (perhaps in this case externalize all of them on fish, wildlife and the citizens of Montana). The international boundary and the lack of habitation of the area by people in British Columbia, coupled with the poor oversight by the BC government, gives them a unique opportunity to exploit Americans. 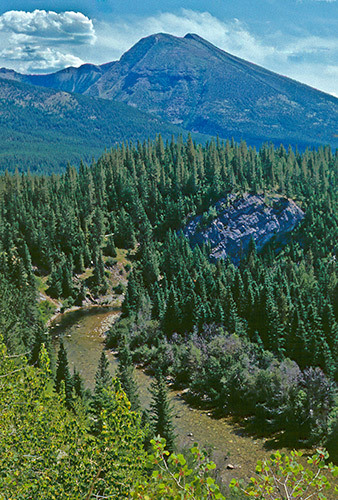 Glacier/Waterton is called an “international peace park”. However the Canadian part of the park is only about 66 thousand acres ( all contained within Alberta) that protects the most scenic landscape. In the past I read that there was a possibility that the Canadian lands to the west (in BC) of Waterton might be added to the park but apparantly that is not going to happen. I read somewhere that BC was considered to be more environmental friendly than Alberta but not in this case. I drove out west thsi summer but didn’t make it up to BC, even though I’d heard (and now seen!) that it was so beautiful. It’s a shame that people don’t take caring the environment seriously.